Cut back on carbs and calories by making wraps tucked into a steamed collard greens leaf. A quick steamed collard green makes a perfect package for a light and flavorful tuna salad. Both leafy greens like collards and tuna fish are filled with inflammation-fighting nutrients, including vitamin C and omega-3 fats. Lean protein and fiber makes this wrap incredibly satisfying, even though it's low in calories. Remove the hard, lower portion of the collard green stem and place the in a large pot of boiling water for 15 seconds. Remove collard leaf, pat dry, and set aside. In a bowl, combine canned tuna, yogurt, mayonnaise, apple, and lime juice and zest; mix to combine. Lay collard green out on a flat surface and place some shredded carrots in the center, followed by the tuna mixture. Like a burrito, fold in both the left and right side of the collard over the filling. Starting at the end closest to you, roll up. Chunk light tuna is a good lower mercury option, or use a combination of canned albacore and chunk light. Replace tuna with canned salmon for an equally delicious and healthy seafood salad. Apples add a wonderful crunch to this salad. Experiment with alternative additions like olives, dried cranberries, slivered almonds, or diced pear. 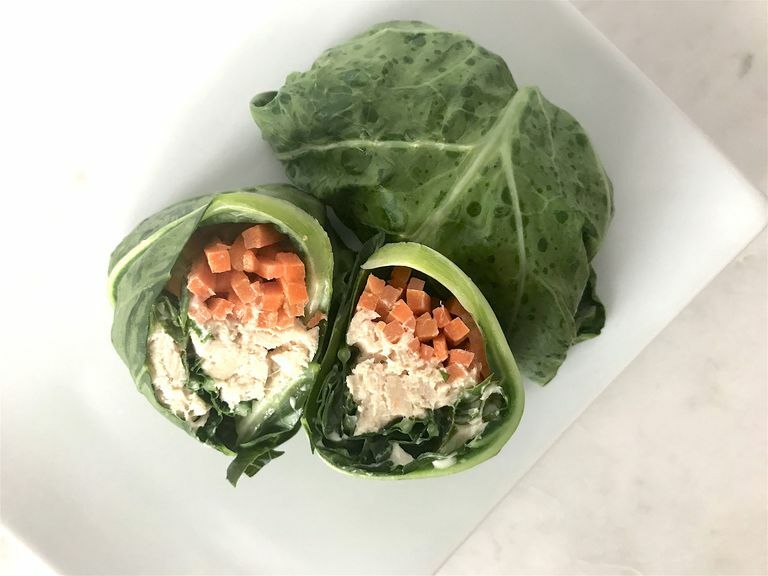 To store these wraps, cover them tightly in plastic wrap and store in the refrigerator or lunch bag along with an ice pack to bring along to school or the office.